TORONTO: The Canadian health department has advised people against using a Neem toothpaste from India, claiming that it contains high levels of harmful bacteria and a chemical found in antifreeze, which was discovered earlier. 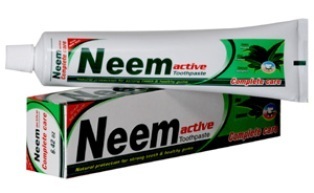 Neem Active Toothpaste with Calcium, made by Calcutta Chemical Co Ltd. in India, should not be used, Health Canada warned. It claimed that ingesting the product could trigger fever, urinary tract infections and gastrointestinal symptoms such as vomiting, diarrhoea and abdominal pain. The health department warning noted that while toothpaste is not meant to be swallowed, young children often do so while brushing their teeth. Children and people with weakened immune systems would be at the highest risk of negative side-effects from using the toothpaste, Health Canada said, adding that Neem Active Toothpaste is not approved for sale in Canada. “Infants, children and vulnerable populations such as patients hospitalised for severe underlying diseases or with compromised immune systems are more sensitive to these effects. Severe vomiting and diarrhoea could lead to potentially life-threatening dehydration,” it said in a press release. Late last month, Health Canada warned Canadians not to use the toothpaste because it alleged that the product had been found to contain unacceptable levels of diethylene glycol or DEG, used in the making of antifreeze.